As Autumn progresses, we at Kestrel Pest Management receive many calls concerning large numbers of flies being discovered in peoples lofts and roof spaces. These flies are called cluster flies, which is an umbrella term for species of flies that enter buildings in large numbers to overwinter. All these species are found outdoors during the spring and summer and it is only as the day length and temperature decrease that the adults seek out places to overwinter. Tens of thousands of these flies can enter properties via gaps in roofs, around windows and gaps in walls, causing alarm to the owners. 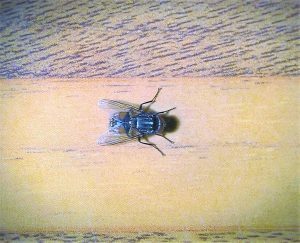 This period of fly entry can take place over many weeks and the temperature fluctuations caused by the weather and internal heating can result in intermittent periods of activity. 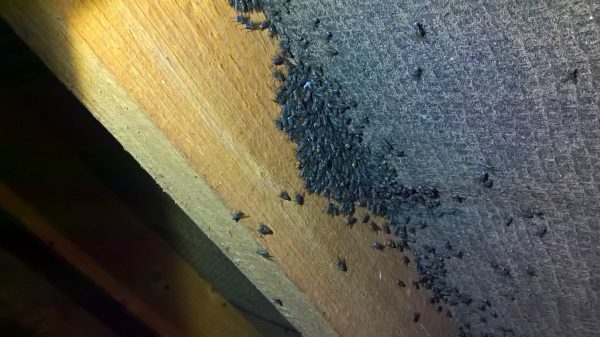 Thousand of flies within the loft can cause a hygiene issue, due to the amount of fly droppings and dead flies. Stored materials can be at risk of spoilage and header tanks can become blocked with fly bodies. A ULV (Ultra Low Volume) treatment of the loft space and affected areas will kill all flies in a period of minutes. 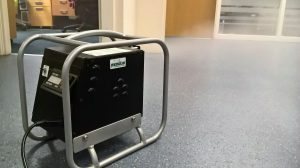 This specialist ULV machine produces a fine mist of insecticide that travels on air currents to permeate all cracks and crevices. 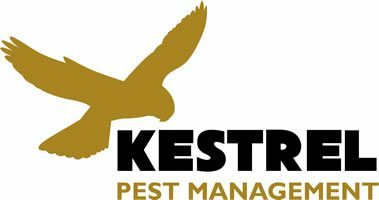 This method is without doubt the most effective treatment and is the method we most often use at Kestrel Pest Management. When this method is used there will need to be a clean up of all the dead flies. Sealing of large gaps around windows and walls could be beneficial if the gaps are obvious. However sealing all gaps that lead to a roof space is virtually impossible so it is not a practical solution. If flies are accessing via minute gaps in window frames then it could be beneficial to apply a residual insecticidal spray to intercept the flies. There are cluster busters, which are large boxes that are filled with a fine sand-like substance that causes the flies to sink and kill them. This method is not immediate in effect but can be a useful alternative when insecticides cannot be used. The sheer number of flies that enter buildings mean that treatment is often beyond the ability of the homeowner/business owner. We therefore recommend that you contact the services of Kestrel Pest Management. We have many years experience dealing with cluster flies and will ensure a rapid eradication of your cluster fly infestation.